People in society need to be inclusive in their conversations. People don’t talk about religion, politics and other touchy subjects because it will evoke a reaction — because they don’t know how to talk about it in a productive way. There is a need to learn to talk about difficult topics in a constructive way, and it applies everywhere in culture. It’s not just the workplace. It’s at home, in the schools, on the sidewalk or with a neighbor. A completely different mentality is necessary. If everyone looked at both viewpoints, they could think more critically and can have more intelligent conversations, said Attorney Danna J. Cotman, Esq., Lawyer’s Club of San Diego president. Owner and president of ARC Intellectual Property Law, Cotman is the only known woman- owned boutique intellectual property law firm in San Diego and one of NCRC’s many partners. Cotman said that NCRC was brought to her attention through the Lawyer’s Club and Judge Susan P. Finlay of the Superior Court, Ret., who worked on NCRC’s Avoiding the Pipeline to Prison program, said that she and her husband were extremely integrated by that program because of its educational component. She said this was the beginning in partnering with NCRC. 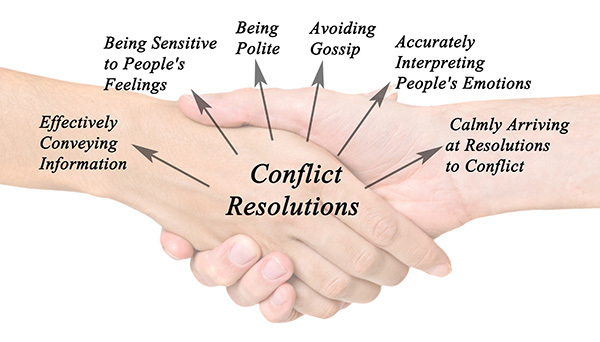 And conflict resolution is what NCRC has specialized in for 35 years. With its humble beginnings in 1983, The San Diego Mediation Center originated from the San Diego County Bar and University of San Diego (USD) Law School and began as a small community communication center in Golden Hill. Steven P. Dinkin, National Conflict Resolution Center (NCRC) president, said the Center resolved different types of community disputes rather than going through the traditional court system. As the years went on, he said NCRC began to focus on how the organization could have a more significant impact across all levels of society — in the community, businesses, and throughout the country in government. Dinkin said if they took the methodology of mediation and supported it, the organization could impact the San Diego region at all levels of society. NCRC developed a series of trainings all based in communication and the mediation methodology that it now utilizes in universities, companies and neighborhoods. This organization’s impact has now expanded internationally. “It’s very timely today where everybody feels a sense of instability, starting with our government, within our families, the neighborhoods, these trainings have become ever more critical,” Dinkin said. The Art of Inclusive Communication focuses on empowering individuals to communicate effectively across cultures and differences in society. The Exchange is a formal mediation process for supervisors and managers to proactively manage conflicts in the workplace. For the Bystander Challenge, NCRC worked with the Lawyer’s Club to empower individuals in the workplace to stand up when they see inappropriate behavior before it escalates to a serious problem. This program is a response to the #MeToo Movement. NCRC is now working on a couple of significant issues across society as it grows and develops. NCRC partnered with the San Diego Unified School District, law enforcement agencies, and the District Attorney’s office for this program. If a youth commits an offense, a misdemeanor or even a felony, and if NCRC is able to come to a resolution through restorative conference, then the DA;s office will drop the charge so the offense will not follow that youth throughout the rest of his or her life. The cost to society. It costs $150,000 a year to house a youth in criminal justice, opposed to $6,000 to complete NCRC’s program. A second major initiative, the Galison Campus Civility Program, comprises of 12 college campuses across the region and the state. With an increase of diversity at universities, there is arguably a lot of tension on these campuses. NCRC trains youth on how to communicate more effectively and have more confidence to interact with others who are different from them. “We are instilling the skill set that they can use on the campus but then, as they go into society and enter into the workforce, they will become citizens with the critical skill set of how to work around differences,” Dinkin said. The Lawyer’s Club of San Diego’s mission is to advance the status of women in law in society. With both male and female members, this year’s theme was to demand equality. As a community-based program, Avoiding the Pipeline to Prison caught Cotman’s attention. She said it was there that she learned all of NCRC’s programs. At the same time, the Lawyer’s Club had partnered with Council member Barbara Bry’s Workplace Equity Initiative, Athena, and Run Women Run in developing a code of conduct for employers in San Diego to adopt, which stemmed from the #MeToo Movement. “We were getting real synergy and the next step was partnering with NCRC,” Cotman said. She attended the early brainstorming session for the Bystander Challenge and was so impressed with the training that NCRC does and the conscientiousness of how NCRC works to be inclusive. Cotman adopted the four I’s that she now runs her business by. “If you want to be successful you need to do or have four things. You need to take initiative. You have to work hard, so you need industry. You have to be educated on what you are doing, so you need intelligence. And then, above all, you need integrity,” she said. Cotman said there is a real need for the civility component in society in general, but especially in law. So there was kind of a movement with what NCRC was doing, what the Lawyer’s Club was doing, what the federal courts were working on, and it all started forming together. Lawyer’s Club sent its staff to each of the trainings. Each one is certified in the Civil Workplace Training and Initiative. “The trainings are so impactful because every single person I know that has gone comes back just gushing with how positive the trainings are and what they found out about themselves, like what they were insensitive to, and the communication is facilitated [forward in the workplace] because they are so excited about it. It can really make good change in workplaces.” Cotman said. She added that some in her own office have gone through the trainings as well. Dinkin said understanding the instability that society is facing is crucial. NCRC identified the workplace as where people spend most of their waking hours — even more so than with members of one’s own family. Dinkin said if NCRC could get a majority of companies in the region committed to a civil workplace, as a community, San Diego could be a model for other cities taking a stand for appropriate behavior in the region and across the country. In order to gain momentum, NCRC needed more key organizations to join in this effort, so they started with the Lawyer’s Club. NCRC also linked with San Diego Downtown Partnership, and Procopio. NCRC is headquartered in San Diego, but it trains nationally and internationally. It has approximately a $5 million budget, a well as a host of mediators and trainers who help implement its work. Dinkin said in working on college campuses there is a lot of interest from other universities across the region. NCRC also works with local government employees, teaching them the same set of skills. Additionally, it works with the Department of Homeland Security and many other federal agencies. “The thing about conflict is that it is like water that seeps into all types of crevices, so it is across society, and as an organization [we] have developed some innovative tools to address that,” Dinkin said. Dinkin said if people are avoiding the tough conversations we can’t really evolve as a society. Dinkin said one way that NCRC promotes its work is with its annual Peacemaker’s Awards Dinner. The 31st Annual Peacemaker Awards will be held on April 6 at the Hilton Bayfront Hotel. Rev. Greg Boyle, founder of Homeboy Industry — which is the largest gang intervention prevention program in the nation — will receive this year’s National Peacemaker Award. Additionally, the Philanthropy in Peacemaking Honoree will be recognized, and The Local Peacemaker Awards will be presented. Learn more about this year’s honorees and the awards dinner at bit.ly/2MFAfDa. 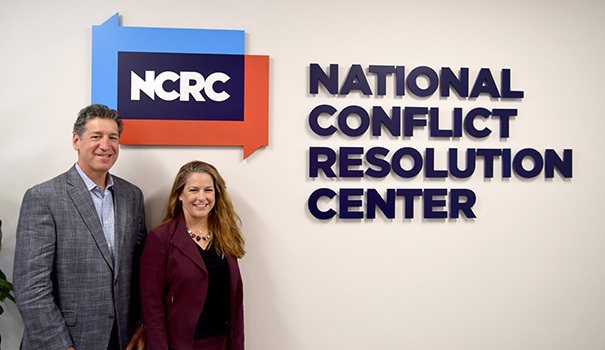 For more information about the National Conflict Resolution Center, visit ncrconline.com.